Join us to discuss topics raised in the episode. We will post a chat summary here after it has taken place in case you miss it. 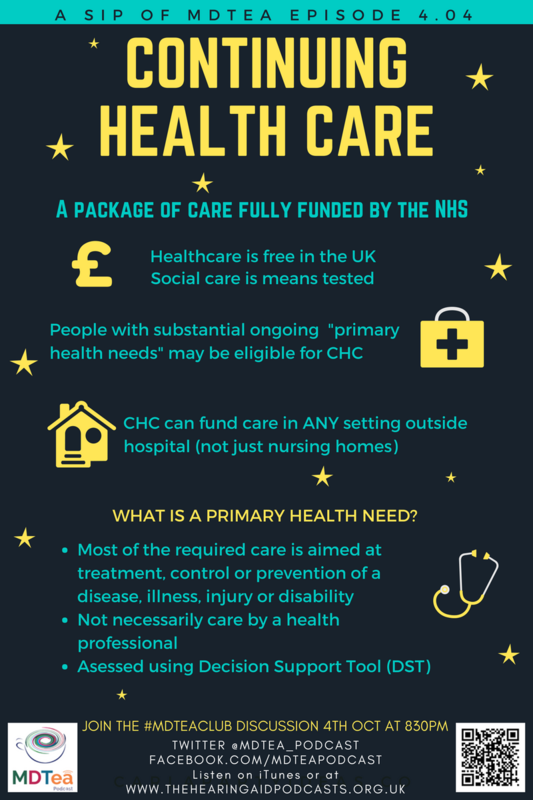 NHS continuing healthcare (sometimes referred to as ‘fully funded NHS Care) is the name given to a package of care that is arranged and funded solely by the NHS for individuals who have been assessed as having a “primary health need”. 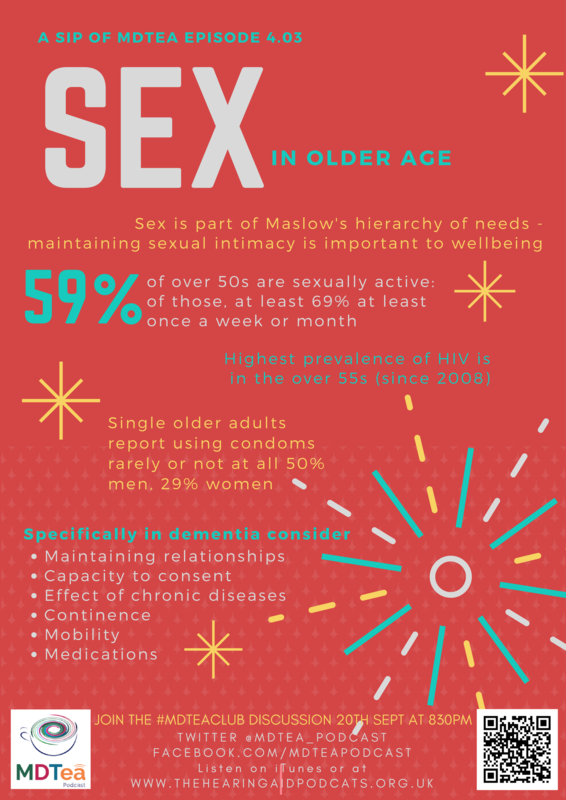 The care or aftercare of a person with these needs, whether or not the tasks involved have to be carried out by a health professional. Healthcare is currently free in the uk. In some circumstances, accessing a care home or other supported accommodation. The nursing or other health services that they need are not of a nature that a social services authority can lawfully provide. In 2015: Nationally the spend on NHS Continuing Healthcare stood at around £2.5 billion per annum and around 60,000 individuals were in receipt of NHS Continuing Healthcare at any given time. The process has to be followed by every CCG, meaning that there should be no variation in access, and the assessment process should be consistent across the NHS. Continuing health care asks the question, who should be responsible for funding the health and social care for an individual. Growth in community care meant, people were encouraged to either remain in their own home or were funded by the then DHSS in nursing homes. The NHS & Community Care Act 1990 placed the responsibility on LA’s to fund residential accommodation for people who were in need of care and attention because of illness. The NHS continued to have the ability to fund NHS places for those people who would have remained in hospital this has become the exception not the norm. 1994 The Health Service Ombudsman challenged this approach to practice in what became known as the ‘Leeds report’. The case was a highly dependent patient, who was discharged to a nursing home where he had to pay for his care. The Ombudsman criticised the drift towards transferring responsibility from (free) NHS care to (means-tested) local authority care, concluding that the failure to provide long-term care within the NHS for this patient was ‘unreasonable and constituted a failure in the service provided by the health authority’. The NHS has a clear responsibility to arrange and fund services to meet the needs of people who require continuing health care. This includes, but is not limited to, arranging and funding care for those people who require continuing inpatient care under specialist supervision from the NHS. Also covers responsibility for arranging and funding rehabilitation, palliative and respite health care, specialist health care, support and community health services for people who live in nursing homes or residential care or at home. To such extent as he considers necessary to meet all reasonable requirements… services or facilities for the prevention of illness and the after-care of persons who have suffered from illness as he considers appropriate as part of the health service. In cases where there are significant health needs the NHS clearly has a responsibility to provide both health and social care. 18 and over and having substantial and on going care needs. 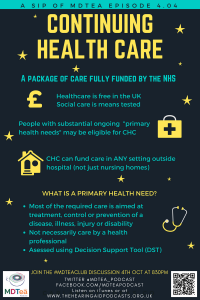 assessed as having a “primary health need”. Ensuring that the person is fully and directly involved in the assessment and the decision-making process. Taking full account of the individual’s views and wishes, ensuring that his or her perspective is the starting point of every part of the assessment process. Addressing communication and language needs. Obtaining informed consent to the assessment process and to sharing records, where the individual has the mental capacity to do this. Dealing openly with issues of risk. The full assessment tool is called the Decision support tool, but there is a screening process before this (think of it like a DST-lite) called the checklist. Both of these tools turn a person’s various care needs into essentially a numerical value. If this screening suggests a person may be eligible a full assessment of needs will be arranged, using a tool called the Decision Support Tool, which is used to assess whether needs relate to a persons health. A full assessment is carried out by a multidisciplinary team, with a minimum of two different professionals (doctor, nurse, social worker, healthcare professional), the aim being to build an overall picture of need. For each domain the nature, intensity, complexity and unpredictability of an individual’s needs are thought about via some guidance statements. The assessment will be shared with person and any disagreements noted. This process can take time and where a more urgent decision is (needed because their condition is deteriorating rapidly) the process can be ‘fast tracked’ via the Fast Track Tool instead. The multidisciplinary team will make a recommendation to the Clinical Commissioning Group (CCG) about the person’s eligibility for NHS continuing healthcare – sometimes referred to as ‘the panel’. The CCG will usually make a decision within 28 day and write to the person advising whether they are eligible, giving reasons for their decision. What happens if the person is eligible? Direct payment – money given directly to the individual to spend on their care. The care needs will be reviewed after 3 month and then, as a minimum, on a yearly basis. What happens if a person is not eligible? The LA will discuss whether the person may be eligible for support from them. On going healthcare needs, will be meet by the NHS – a joint package of care. The funding arrangements for on going care are complex and this is a highly sensitive area; which can affect individuals at a difficult stage of their lives.